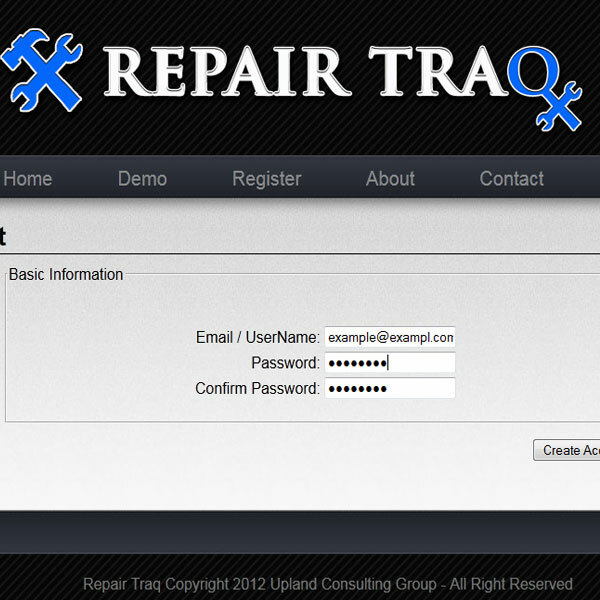 Free Universal Repair Tracking System - Simple To Use - Free! Perfect for Watch repair, Jewelery stores, bike shops, and more! Ditch excel and pushing paper for good! 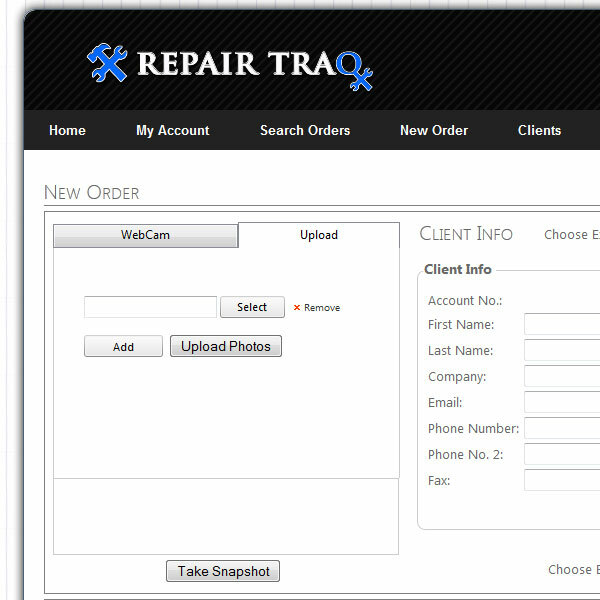 Spend more time growing your business with Repair Traq. Is This Good For My Shop? The first step of the process to register a free account with us. 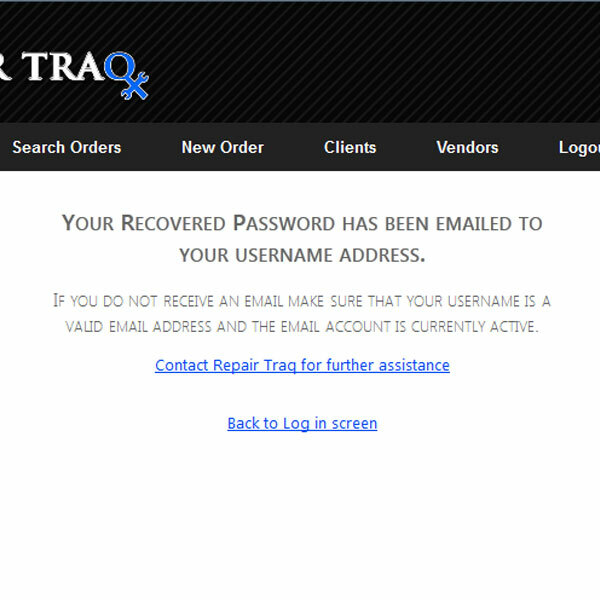 This account allows you access to the Repair Traq system and its database where you store all of your order, vendor, and client information. Registration is extremely simple: click on the link above in this pages main navigation that says "Register". Here you will see three text boxes for you to enter your email address (which will be used for your username and to log into the system), as well as your password. Please make sure that your email/username is a valid email address and is currently being used. After submitting your email and password if all goes well you will be greeted with a confirmation message as well as an email confirmation to the email address specified by your username. 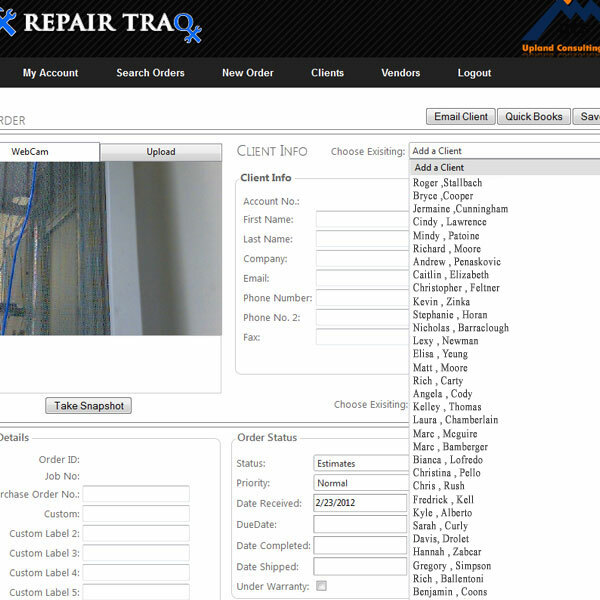 You are automatically logged into the system and have access to all of our demo system pages. If you would like to enter the system simple click on the Demo link in the pages main navigation above where you will be brought to the "New Orders" page. If you have already successfully registered your account you will be emailed with a confirmation that includes your username and password. Unless changed, this will be your login username and password for entering the system. If you have just registered (from step 1) you can skip this step because we have automatically logged you into the system. Otherwise, you must first log into your account by clicking on the Demo link in the main navigation of the site. Once at the login page you will be asked for your email/username and password that you used when you registered for the software demo. If you cannot remember your password you can enter in your email/username and then click the "I forgot my password" link. Or refer to the confirmation email that was sent to your username email address. Upon clicking the "I forgot my password", your password will be emailed to you email/username. After entering your username and password you will be logged into the system and will be brought to the Search Orders page and your are fully logged into the system and database. This page is designed to allow you to view, edit, or delete any orders that you specify. The My Account tab links to your Account Information page. This page is what allows you to hold and edit all of your particular accounts information for contact, email, your company, telephone number, etc. It also gives you access to your accounts customizable Email and PDF subject and body text, and even upload your own personal company logo. Here you can view your username, as well as change your password to log into the system. If you would like to edit your password after you have created your account you can do so in the Account Information page which is found after clicking the "My Account" tab in the main navigation of the system. Within the Change Password fieldset there are two text boxes where you can enter your desired new password, as well as a confirmation text box of the new password which must match. Click "Save Password" after both text boxes are filled out appropriately and your new password will be saved. 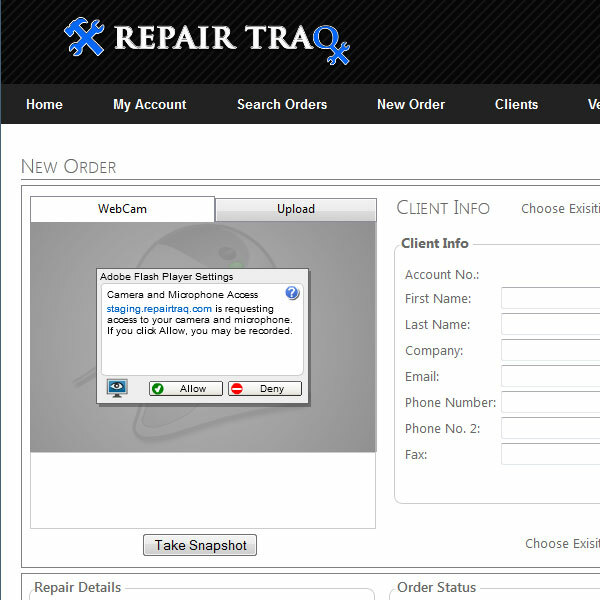 If you would like a more personalized look to the Repair Traq software we encourage each of our customers to upload their company logo. After uploading, the logo will appear in the top-right portion of the header of the site in each of the system pages, as well as within the PDF document for your repair ticket. To upload a logo, click the "select" button of the file uploader on the Account Information page, Select any image file from your computer that you would like as your logo, and then click Upload. We recommend a logo that is has a height / width ratio of 2/3. This means that a logo that is 100 pixels x 150 pixels or 200 pixels x 300 pixels is perfect. The uploaded logo should be in .jpg, .png, or .gif file format. 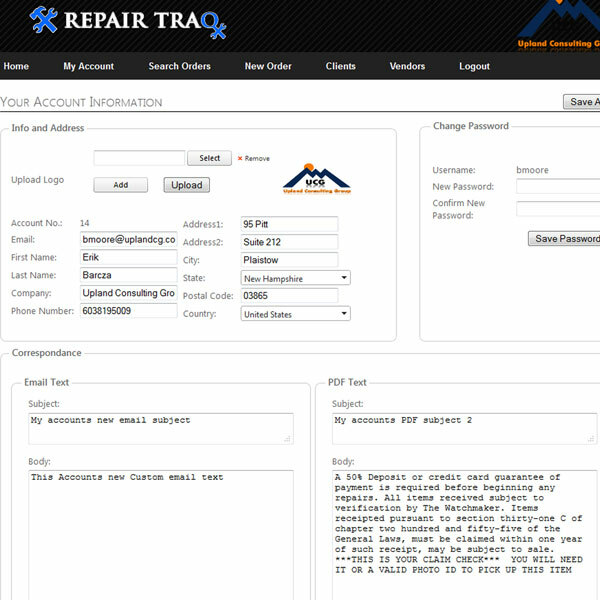 Repair Traq allows you to customize the subject and body text of your Client Email and order ticket PDF document. To customize these simply visit the Account Information page under the My Account tab in the main navigation of the site. 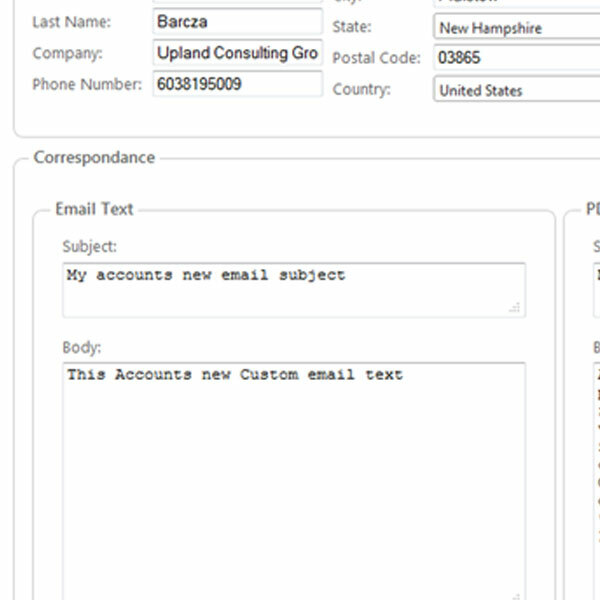 Under the Correspondance field set you will see Email Text and PDF text headers with Subject and Body text areas. Whatever you type into these text areas will be saved and applied to your Email and PDF subject and body. After you are happy with your text simply click the "Save All" button on the top-right of the page and all of your changes will be saved. 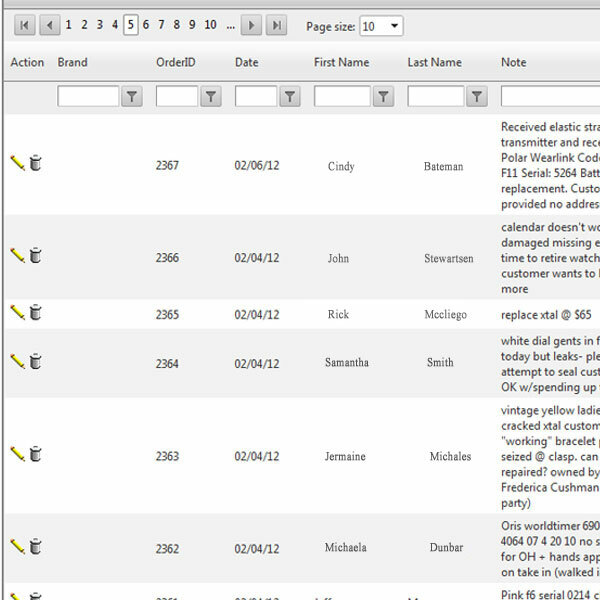 The Show Orders page is designed for users to view or filter all of their orders within the system. The only component of the page is a data table of already saved orders that can be filtered or sorted by any data column so you can narrow down or find your result sets. You can filter by Order ID, client name, date, and more just to get started. In order to filter your columns click within the text box of the column you want to filter with the filter icon and type in any value. 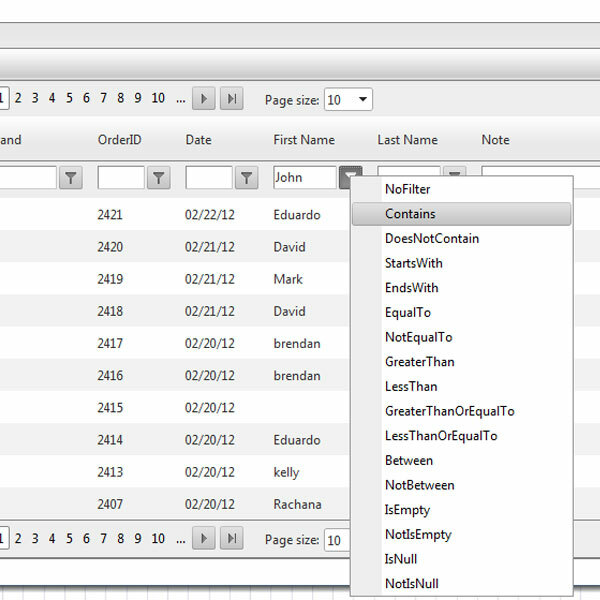 Click the filter icon for that column and a dropdown of options will appear for ways you can filter your data. Finding the data you need is made easy and precise with over 15 filter options to choose from. One of the primary uses of the Show Orders data table is the ability to either edit or delete your orders. Both options can be found in the "Action" column on the very left of the table which carries two icons: a delete and an edit icon. By clicking the edit icon you will be immediately redirected to the Orders page with all of the values of that order filled into the input fields exactly as the order was saved. By clicking the delete icon you can delete the order as if it never existed. The New Orders page has two main functions: 1. Add a brand new order or 2. Edit an already existing order. 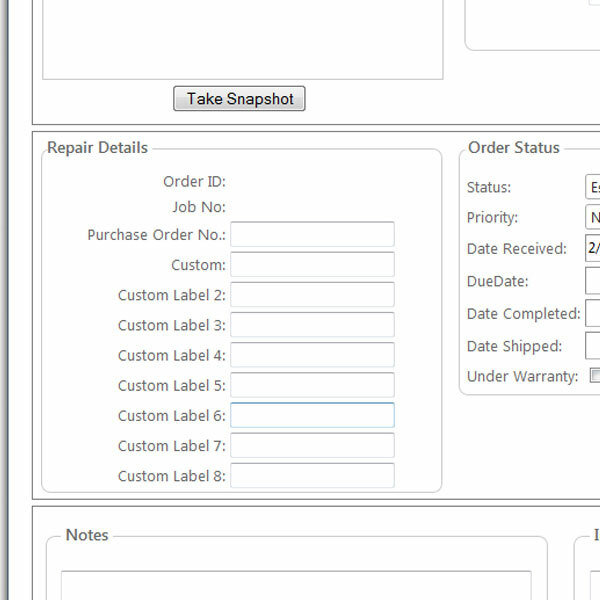 Editing an order can be done by clicking the edit icon (pencil) for that order in the Show Orders page's data table. A brand new order requires only a client to save the order. You can either choose an already existing client right from the drop down list in the top right of the page, or create a brand new client by filling out the required form fields. The client will be saved automatically when the Save Order button is clicked right along with any order information you filled out, pictures, etc. If your particular order requires a vendor, then you can easily either choose an exisiting vendor from the vendors drop down list, or click the Add / Edit Vendor button with no vendor selected in the drop down. 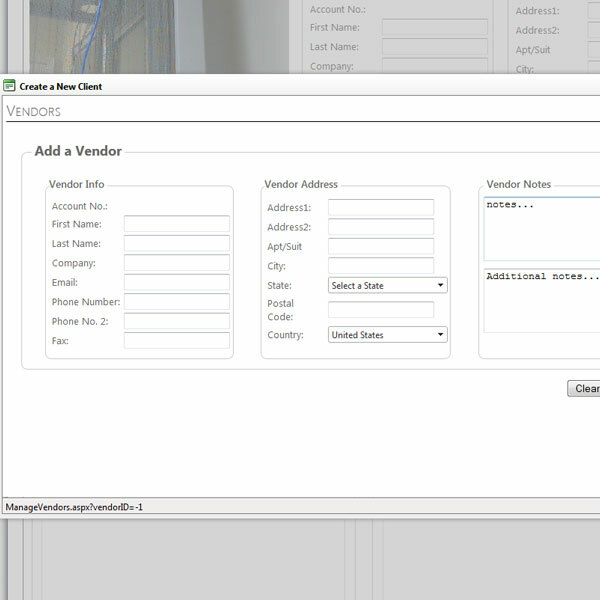 Clicking the button will create a popup screen that will either load the vendor selected in the drop down for you to edit, or give you a brand new form to fill out and create a new Vendor. Upon clicking the Save Order button your vendor will be saved along with your order. We know that every business is different, and that means that the needs of each of our customers is different as well. 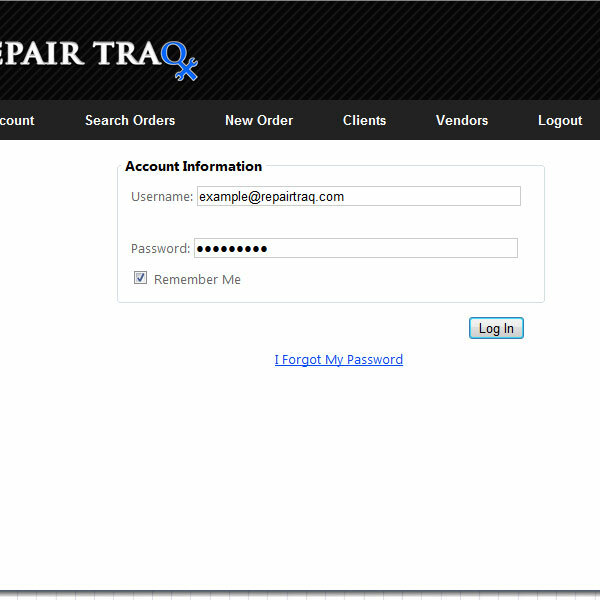 The Repair Traq system allows you the freedom to customize the labels of your Repair Details section of the New Orders page. To customize your labels, click on the "configuration" link under the My Account tab drop down in the main navigation of the website. In the area labeled "Custom Fields", edit or replace the existing generic labels (Custom Label 1 etc.) with any text of your choice. Click Save Fields and the next time you visit the New Orders page, the labels in the Repair Details Section of the page will reflect your changes. 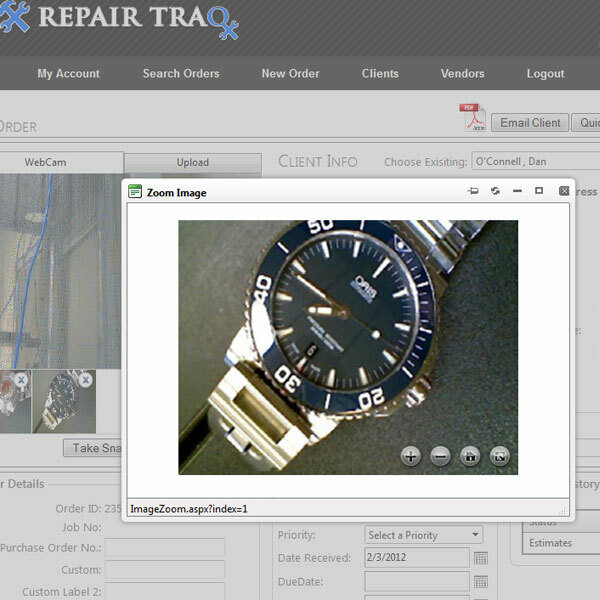 The Repair Traq order management database allows you to save as many pictures as you want with each order. The system either work directly with any webcam that is plugged into your computer, or you can upload pictures. Our system will automatically sense your webcam if available and will ask you for permission to access the camera. If you click allow, the webcam will load up and you are ready to start taking pictures. If you want to allow access to your camera automatically on page load then you can right-click on the allow / deny prompt, choose Settings, and then click the allow and remember check boxes. If you do not have a web cam you can upload photos instead. To upload photos simply click on the "Upload" tab right next to the WebCam tab, in the top-left of the screen. In order to upload a photo, click the select buttom which will open a pop-up letting you navigate to the photos you want to upload on your computer. Double click on a photo of your choice, and click the "Upload Photos" button. If you want to make multiple picture uploads at once, click the "add" button which will give you multiple uploads. The file types that are allowed consist of most general picture files including: .jpg, .png, .bmp, and .gif, and Uploader does not care about the size of the picture. After you have uploaded or taken snapshots with your webcam, each of the pictures will appear in a thumbnail below the upload or webcam area. Here you can either click on the thumbnail which will open the picture in a pop-up where you can zoom in and out on the picture as desired. To delete a picture simply click on the "X" icon in the top-right corner of each thumbnail, and by doing so your picture will now be deleted permanently. 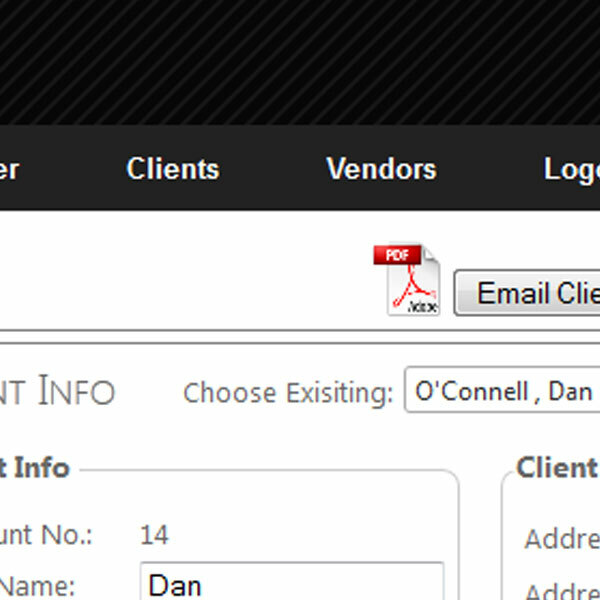 The new order screen allows you to email your client with any existing order. 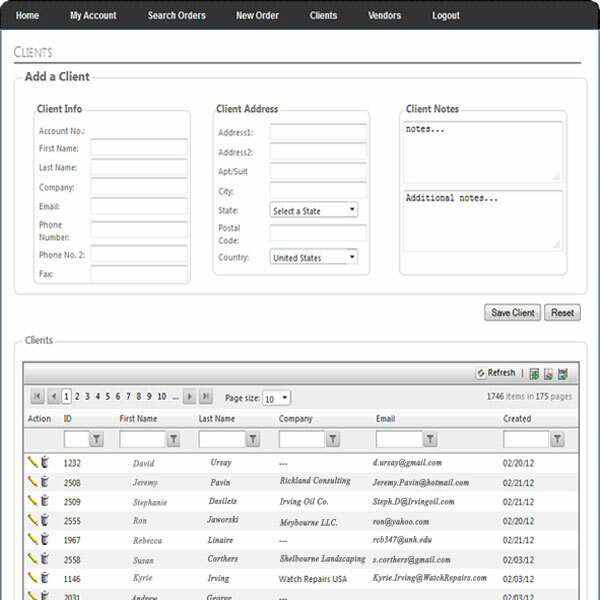 You can email the client of a particular order by simply loading up an existing order from the Show Orders page, and then clicking the "Email Client" button. The button will create a pop-up that will fill in the clients email, your accounts customizable subject text, the body of the email as your customizable body text, and the From address as your accounts email address. Each of these customizable fields can be edited from the My Account page to your liking. The email also allows you to attach any or all of the pictures that you have available for your order. To attach a picture click in the checkbox of the picture(s) you want attached, and leave blank the pictures you do not need. Click send and your email will be sent to your client. After you load up an existing order, each order is available for export to a pre-formatted PDF document that can easily be used as an order claim check. The PDF allows you to choose which picture you would like to include along with a customizable subject, body content, and you and your clients relevant information. Your accounts information as well as the customizable subject and body content can all be edited via the My Account page. In order to filter your columns click within the text box of the column you want to filter with the filter icon and type in any value. 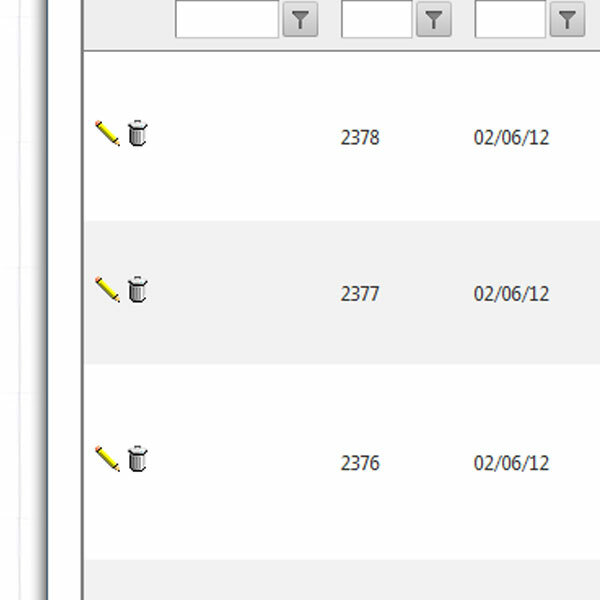 Click the filter icon for that column and a dropdown of options will appear for ways you can filter your data. Finding the data you need is made easy and precise with over 15 filter options to choose from. 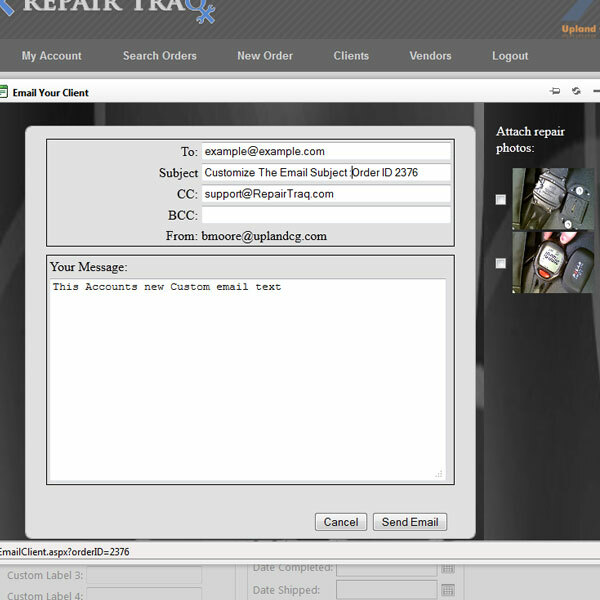 If you find that you want even more control over the data in the orders table the Repair Traq system has integrated data tables that are fully exportable to Excel, PDF, and Comma Separated Values. All you need to do is click on which option you would like and the data table and its values in their entirety will be exported to an excel spreadsheet, PDF document, or CSV file. The export buttons are located at the top right of the data table. One of the primary uses of the data tables is the ability to either edit or delete your records. Both options can be found in the "Action" column on the very left of the table which carries two icons: a delete and an edit icon. By clicking the edit icon you will be immediately redirected to the Orders page, or load up your records in-page for Clients and Vendors with values filled out exactly as they were saved. By clicking the delete icon you can delete the order as if it never existed.